Prominent & Leading Manufacturer from Chennai, we offer office pantry services. 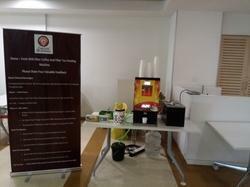 Chennai Beverages are the prominent pantry service provider for office coffee services or pantry service counter with manpower features. Let us start your office pantry service or vending machine solution for you. To commence the office pantry service, You can get us a free of cost demo according to your employee strength. Looking for Pantry Services ?